Born: 16th October 1882, Ipswich. Died: 20th November 1917; age 35; KiA at Passchendaele. Occupation: Sub-Postmaster, Grocer & Draper. Enlistment Location: Bury St. Edmunds, Suffolk; date: 22nd November 1916. Date of Entry Therein: March 1917. Percy was a member of the No. 9 Livermore Voluntary Aid Detachment at Suffolk. He held the Red Cross Proficiency Medal for First Aid, and was regularly selected to represent the No. 9 detachment in the Red Cross competitions held before the outbreak of the war. During the war Percy was a regular attendant at Ampton Hall Red Cross Hospital, Suffolk to help on the arrival of the convoys of wounded. Rank: Private; Service Number: 41824. 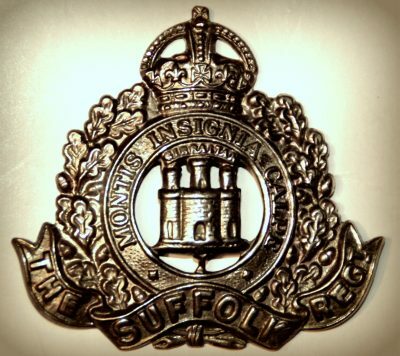 Regiment: Suffolk Regiment 4th Battalion, ‘B’ Coy. Panel 40 to 41 & 162 – 162A. Relatives Notified & Address: Son of George & Selina Shelbourne, of Ipswich; husband of Florence Shelbourne, of Pakenham, Suffolk. 1891 32, Bramford Lane, Ipswich. Percy was 8 years old and living with his widowed mother & sisters. Selina Shelbourne (nee Throsby), 51, Living on own Means, born Leicester, Leicestershire. Edith Mary Shelbourne, 14, born Levington, Suffolk. Ellen Jane Shelbourne, 12, born Levington. Rose Jessie Shelbourne, 10, born Levington. 1901 53, Felixstowe Road, Ipswich. Percy was 18 years old, a Grocer’s Assistant. He was living with his mother & sisters. Selina, 61, Living on own Means. 1911 Post Office, Pakenham Street, Bury St. Edmunds, Suffolk. Percy was 28 years old, married and a Grocer & Draper – employer – at home. His sister was a Shop Assistant at the Post Office. On the 1911 census, Percy’s wife and daughter are living with his mother & sister. May Shelbourne, 6, born Hounslow, Middlesex. Percy’s father was George Shelbourne, born 1841, Hough, Lincolnshire – died 1886, Ipswich. A Surveyor and Accountant. Brenda Vera Shelbourne, born November 1908, Pakenham, Suffolk. Freda Grace Shelbourne, born May 1914, Bury St. Edmunds. Probate to Florence Shelbourne – widow. Percy is also remembered on the war memorial at St. Mary’s Church, Pakenham. Suffolk. After Percy’s death, Florence became the operator for the telephone exchange at Thingoe, Suffolk. Percy’s sister Rose became Florence and her children’s housekeeper.